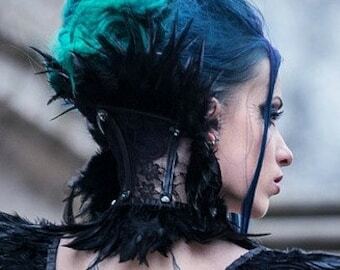 This neck corset is made of black fine quality elastic lace, reinforced with spiral steel boning and decorated with black feathers (length of feathers 8-10cm ).Corset lacing behind. Measure your neck perimeter in the middle, not lower. 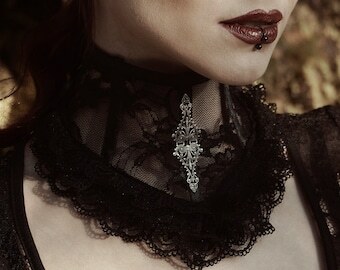 ♥"This neck piece is absolutely gorgeous! It is much more beautiful in person than it is in the photos - and exceptionally well made! I can't wait to wear it!!" ♥"Fast shipping eventhough I am on the other side of the world. I can't thank you enough for all your help. I will buy again"
♥"Very beautiful:-> Thank you so much." ♥"Gorgeous piece!!!! Original photograph by me"
♥"Superb product, love it. Higly recomended shop"
♥"Love it! Very good Fabric and workmanship!" Love it! Very good Fabric and workmanship! Superb product, love it. Higly recomended shop.